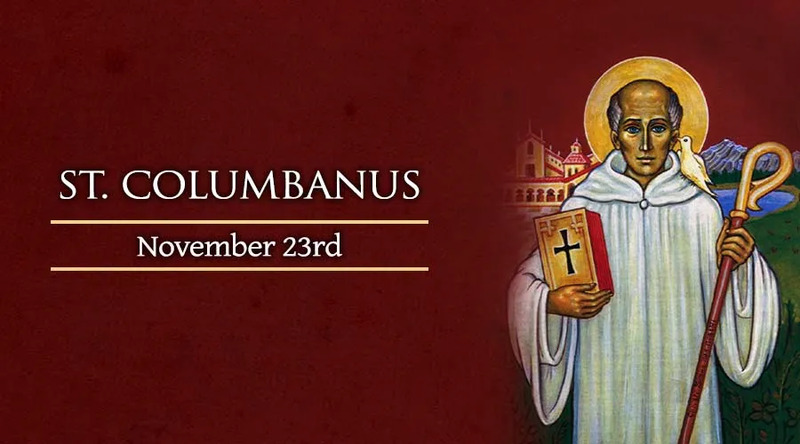 An originator of Ireland's unique monastic tradition, who went on to serve as a missionary to continental Europe during the early Middle Ages, the abbot Saint Columbanus – also known as St. Columban – is honored by the Catholic Church on Nov. 23. Despite their similar names and biographies, St. Columbanus is not the same person as Saint Columba of Iona, another monk from Ireland who spread the faith abroad and lived during the same time period. Born during 543 in the southeastern Irish region of Leinster, Columbanus was well-educated from his early years. Handsome in appearance, he was tempted by women and was eventually advised by a nun to follow her example and flee from temptation by embracing monasticism. His mother disapproved of this intention, but his will prevailed even when she tried to prevent him from leaving home. The aspiring monk studied initially with Abbot Sinell of Cluaninis, before moving on to a monastery headed by the abbot later canonized as Saint Comgall. It was under his direction, in the Abbey of Bangor in County Down, that Columbanus formally embraced the monastic calling, as one of a growing number of monks drawn to the Bangor community's ascetic rigor and intellectual vitality. Though Columbanus was known as a dedicated monk and scholar, around the year 583 he felt called to undertake foreign missionary work. Initially denied permission by the abbot, he was eventually allowed to depart with a band of twelve men, with whom he sailed to Britain before reaching France around 585. There, they found the Church suffering from barbarian invasions and internal corruption. Received with favor by King Gontram of Burgundy, Columbanus and his companions founded a monastery in an abandoned Roman fortress. Despite its remote location in the mountains, the community became a popular pilgrimage site, and also attracted so many monastic vocations that two new monasteries had to be formed to accommodate them. These monastic communities remained under Columbanus' authority, and their rules of life reflected the Irish tradition in which he had been formed. Meanwhile, as they expanded, the abbot himself sought greater solitude, spending periods of time in a hermitage and communicating with the monks through an intermediary. As heirs to the Irish monastic tradition, Columbanus and his monks ran into differences with the bishops in France, partly over the calculation of the date of Easter. He also met with opposition from within the French royal family, because of his insistence that King Thierry should not live with a woman outside of wedlock. He had been urged to do so by his grandmother Queen Brunehild, who thought a royal marriage would threaten her own power. Columbanus' moral stand for marriage led first to his imprisonment, from which he escaped. But the king and his grandmother had him driven out of France by force, and they separated him from his monks by insisting that only those from Ireland could accompany him into exile. This group traveled and evangelized in present-day Germany, though political circumstances eventually forced them to cross the Alps into northern Italy. Welcomed by the ruling Lombards, Columbanus nonetheless found the Italian Church troubled by heresy and schism. The monk wrote against the Arian heresy (which claimed that Christ was not God but only a highly exalted creature), and asked Pope Saint Boniface IV to help restore the unity of the Church in the region. Columbanus himself was involved in a theological dispute with Pope Boniface, but he remained “bound to the Chair of Peter” and acknowledged the Pope's authority. Having received a grant of land from the Lombard king, Columbanus founded his last monastery in the town of Bobbio during 614. Although St. Columbanus died on Nov. 23 of the following year, the abbey at Bobbio remained a center of theological orthodoxy and cultural preservation for centuries afterward.